To Cite: Kiani S J, Taheri T, Nejati A, Maleki M, Rafati S, et al. Repression of the Internal Ribosome Entry Site-dependent Translation of Hepatitis C Virus by an Engineered PUF Protein, Hepat Mon. 2017 ; 17(2):e45022. doi: 10.5812/hepatmon.45022. Background: Pumilio/fem-3 mRNA binding factor (PUF) proteins can bind RNA in a sequence-specific manner. The deciphered RNA-recognition code of these proteins has enabled researchers to design engineered PUF proteins, capable of binding to any desired target in order to modify its ultimate fate. In this study, a modified Homo sapiens Pumilio 1-homology domain (HsPUM1-HD) was engineered to bind to the internal ribosome entry site (IRES) of hepatitis C virus (HCV) genome to potentially inhibit viral translation. Methods: Based on the RNA-recognition code, required modifications were applied to HsPUM1-HD in order to change its natural recognition sequence to a sequence in the stem-loop III of HCV IRES. RNA protein pull-down assay was performed to assess the sequence specificity of the modified HsPUM1-HD (mHsPUM1-HD). Translational inhibitory effect of mHsPUM1-HD was evaluated in a dual-luciferase reporter assay. Results: The mHsPUM1-HD was found to bind to its cognate RNA in a sequence-specific manner, as a biotinylated target RNA captured mHsPUM1-HD through binding to streptavidin magnetic beads. This protein also reduced HCV IRES-dependent firefly luciferase translation by 40% in HEK293 cells. Conclusions: The present study is the first report of an engineered HsPUM1-HD with potential anti-HCV activity. These findings suggest that PUM-HDs can be engineered to target desired RNAs of infectious agents in order to specifically interrupt protein translation, as an essential step of their life cycle. Hepatitis C virus (HCV) is the major causative agent of chronic hepatitis. It is estimated that more than 185 million people are chronically infected with HCV worldwide (1). Only 5% of these individuals are aware of their infection, and only around 0.25% of HCV carriers are actually treated (2, 3). With no vaccine yet available, the current antivirals including interferon, in combination with ribavirin, induce a sustained virological response in less than 50% of genotype 1-infected patients, albeit with extensive side-effects. Efforts for the development of new antiviral drugs have led to the introduction of direct-acting antiviral agents (DAAs); this is in fact a promising progress in the treatment of chronic HCV infection (4). However, limitations, such as the emergence of drug-resistant mutants, patients’ unresponsiveness, and prohibitive cost of DAAs, make the challenge against HCV infection a long and tough battle (5, 6). HCV is a small enveloped virus, containing a single-stranded positive-sense genomic RNA of about 9.7 kb in length. The single long open reading frame (ORF) of the genome is flanked by two untranslated regions (UTRs), with secondary structures extremely vital for replication and/or translation of viral RNA (7). The 5’-UTR contains essential replication signals for the negative-strand RNA, which serves as a replicative intermediate (8). This region with four major structural domains is one of the most conserved regions among HCV genotypes. Among the mentioned domains, domains II, III, and IV form the internal ribosome entry site (IRES) (9). The IRES interacts directly with 40S ribosomal subunit and leads to the initiation of cap-independent translation of viral polyprotein precursor (~ 3000 amino acids). To reach optimal IRES activity, a short sequence of the core gene, with around 30 nucleotides in length, seems to be required (10). Theoretically, every element that can disrupt the IRES and/or disturb the interactions between IRES and 40S ribosomal subunit can prevent virus polyprotein translation. In addition to interfering RNAs (11), aptamers (12), and ribozymes (13), RNA-binding proteins (RBPs) can be recruited in order to hamper these interactions. Among several families of RBPs, extensive research has been performed on Pumilio/fem-3 mRNA binding factor (PUF) proteins, as they can bind RNA in a sequence-specific manner. The consensus recognition sequence for Homo sapiens Pumilio 1, as one of the PUF proteins, is an eight-nucleotide sequence of 5’-UGUANAUA-3’, in which N can be A, C, or U bases (14, 15). A highly conserved RNA-binding domain, known as Pumilio-homology domain (PUM-HD), is the prominent characteristic of these proteins. PUM-HD consists of eight tandem repeats of about 36 amino acids (N-terminal repeat-1 to C-terminal repeat-8) (Figure 1A), which run anti-parallel to RNA nucleotides from 3’ A-8 to 5’ U-1 (Figure 1B) (12, 13). Each repeat recognizes a specific RNA base with a relatively conserved simple code of specific amino acids in positions 12, 13, and 16 (Figure 1C). The outstanding feature of PUF proteins is that the code can be reprogrammed in order to change the sequence specificity of the protein. These modified proteins have been adapted for translational regulation (14), probing specific RNAs (15, 16), and engineering desirable splicing factors (17). Figure 1. Pumilio-Homology domain from human pumilio1 in complex with hunchback NRE. A) The eight tandem repeats of HsPUM1-HD Structure are composed of three α-helices of which the second helix (green) is responsible for base recognition. B) The scheme of anti-parallel recognition of eight RNA Bases by Eight Repeats of PUM-HD. C) the RNA-recognition code of PUF Proteins. A distinctive combination of amino acids in positions 12, 13, and 16 of each repeat specifies the recognition of each RNA base. The Figure was prepared with Molsoft ICM-Browser software, based on PDB accession code 3Q0P. While some HCV inhibitors can target IRES and hamper viral replication to some extent, directing an RBP specifically towards IRES is still a major challenge. In line with this view, the present study aimed to engineer a modified Homo sapiens PUM1-HD (mHsPUM1-HD) to bind to HCV IRES in a sequence-specific manner and potentially inhibit its critical role in cap-independent translation of viral polyprotein. The complete sequence of Homo sapiens pumilio homolog 1 (NM-014676) was obtained from the GenBank. The nucleotides corresponding to the Pumilio-homology domain of this protein (wHsPUM1-HD; nucleotides 2595 - 3641; amino acids 828 - 1176) were selected, and the exact position of amino acids related to eight repeats was identified. In order to change the sequence specificity of wHsPUM1 - HD from consensus UGUAUAUA to UGGAUAAA, the nucleotides (corresponding to amino acids 12, 13, and 16) were modified, based on the recognition code of PUF proteins. Briefly, to switch the recognition code of repeat 6 from U to G, Glu-1047, Tyr-1044, and Asn-1043 were substituted with glutamic acid, asparagine, and serine, respectively. In addition, to switch the recognition code of repeat 2 from U to A, Glu-903, Tyr-900, and Asn-899 were substituted with glutamine, asparagine, and cysteine, respectively. The UGGAUAAA sequence is located in HCV IRES stem-loop IIIb (nucleotides 199 - 206). The wHsPUM1-HD (as the negative control) and mHsPUM1-HD fragments, flanked by restriction sites of NheI and NcoI at 5’ and XhoI at 3’, were synthesized and cloned into pBluescript II SK(+) vector by Biomatik Corporation (Ontario, Canada). The bicistronic dual luciferase reporter construct was modified from psiCHECK2 plasmid (Promega Corporation; Madison, WI, USA), as previously described (18). The psiCHECK2 plasmid contains two luciferase genes, including Renilla and Firefly luciferases. The Renilla luciferase is expressed through SV40 promoter, while the expression of Firefly luciferase is controlled by HSV TK promoter. The HCV IRES (genotype 1) DNA sequence (341 nucleotides of 5’UTR, along with the first 36 nucleotides of the core gene and the coding sequence for the first 10 amino acids of Firefly luciferase) to retrieve the original sequence of psiCHECK2 plasmid)], flanked by PmeI and ApaI restriction sites, was synthesized and cloned into pBluescript II SK(+) vector by Biomatik Corporation (Ontario, Canada). In order to implant the DNA sequence of HCV IRES between two luciferase genes, the psiCHECK2 plasmid was cut with the restriction endonucleases, PmeI and ApaI (Roche; Basel, Switzerland) (30 bp downstream of the Firefly luciferase gene) and ligated with the HCV IRES-encoding DNA, which had been cut with the same enzymes. Transcription from the resulting construct led to the production of a bicistronic mRNA in which translation of the first Renilla luciferase is cap-dependent, while translation of the second Firefly luciferase is mediated by HCV IRES (Figure 2). In order to express wHsPUM1-HD and mHsPUM1-HD in prokaryotic cells, the two synthesized fragments were digested with NcoI and XhoI and were ligated into the pET-28b expression plasmid (Novagen Inc., Madison, WI, USA), previously digested with NcoI and XhoI. The wHsPUM1-HD-pET-28b plasmid was used as the negative control. Recombinant plasmids were transformed into BL21(DE3) cells, and protein expression was induced as follows: 20 ml of fresh Lysogeny broth medium was inoculated with 1 ml overnight culture of BL21 (DE3) cells, supplemented with ampicillin, and were grown for additional 2 hours at 37°C. To induce protein expression, 1 mM of isopropyl ß-D1-thiogalactopyranoside (IPTG) (Qiagen; Hilden, Germany) was added to the medium, and the cells were grown for 16 hours at 20°C. Bacterial pellets were resuspended in sonication buffer (20 mM HEPES pH: 7.5, 300 mM NaCl, 100 mM imidazole, 10% (v/v) glycerol, and 2 mM DTT), supplemented with 1 complete protease inhibitor tablet (Roche; Basel, Switzerland), and lysed by sonication. After centrifugation, presence of the protein in the supernatant was examined by both sodium dodecyl sulphate-polyacrylamide gel electrophoresis (SDS-PAGE) and Western blot analysis. In order to analyze the sequence-specific binding of mHsPUM1-HD to its cognate sequence, RNA-protein pull-down assay was performed (Figure 3). To capture potential RNA-binding protein of interest (mHsPUM1-HD) from cell lysate proteins, two biotinylated RNA baits were designed. To include our target (UGGAUAAA) and control (ACAACAUA) sequences in the middle of a loop, let7i backbone was manipulated. The publicly available MFold software was used to predict the optimal secondary structure of the designed RNA stem-loops. The biotinylated RNA sequences were synthesized by Metabion (Planegg, Germany). These RNA baits were supposed to link the RNA-binding protein of interest to the μMACS Streptavidin MicroBeads (MiltenyiBiotek; Bergisch Gladbach, Germany). In brief, the cell lysate (900 μL) was incubated with biotinylated RNAs for 1 hour at 4°C on a rocking platform. Streptavidin MicroBeads (100 μL) were added to the mixture and incubated for additional 15 minutes at room temperature. In order to prepare a μColumn (MiltenyiBiotek), two washing steps were performed with 100 μL of equilibration buffer for protein applications, while the column was held by a μMACS Separator (MiltenyiBiotek). Subsequently, the whole volume of the binding reaction was added to the column. Four washing steps with 200 μL of the binding buffer (10 mM HEPES pH: 7.0, 50 mM KCl, 10% glycerol, 1 mM EDTA, 1 mM DTT, 0.5% Triton X-100, 0.15 µg/ml yeast tRNA, and RNase inhibitor) were performed to clean-up non-specifically bound proteins. In order to elute the potential RNA-binding protein of interest, 200 μL of binding buffer supplemented with 1M NaCl was applied on the column and all fractions were collected. Then, 20 μL of each fraction was analyzed by 10% SDS-PAGE and Western blot method to detect proteins which were retained by the bait RNAs. For this purpose, BL21(DE3) cells were transformed with either pET-28b plasmid, containing mHsPUM1-HD or wHsPUM1-HD gene. Then, the cells were induced with IPTG, lysed by sonication, and resolved in SDS-PAGE. Similarly, human embryonic kidney-293 (HEK-293) cells, cotransfected with reporter and mHsPUM1-HD-expressing plasmids, were lysed and resolved using SDS-PAGE. The lysate was then transferred from the gel onto a nitrocellulose membrane and probed, using anti-His primary antibody (Qiagen; Hilden, Germany) and anti-IgG secondary antibody (Southern Biotech; Birmingham, AL, USA). After washing, the bands were visualized by either 0.05% 3,3’-diaminobenzidine tetrahydrochloride hydrate (DAB) (Sigma-Aldrich; St. Louis, MO, USA) and 0.01% H2O2 or enhanced chemiluminescence western blot detection system (Amersham Biosciences; Little Chalfont, UK). In order to express wHsPUM1-HD and mHsPUM1-HD in eukaryotic cells, the synthesized fragments were inserted into the pcDNA3.1+ expression plasmid (Invitrogen; Carlsbad, CA, USA), using NheI and XhoI restriction sites. HEK-293 cells were grown in polystyrene flasks (Orange Scientific; Braine-l’Alleud, Belgium) in Minimum Essential Medium (MEM) (Gibco; Paisley, Scotland), supplemented with 10% heat-inactivated fetal bovine serum and 1% penicillin/streptomycin at 37°C plus 5% CO2. When the cells were 80% - 90% confluent, they were harvested with 0.05% trypsin for transfection. For this purpose, HEK-293 cells were seeded into 96-well plates at a density of 2×104 cells per well the day before transfection. For each well, 1 μg of plasmid DNA was diluted in HEPES-buffered saline (HBS) and mixed with 4.5 μL of linear polyethylenimine 25 (LINPEI 25) (10 μM) (Polysciences; Warrington, PA, USA). After 15 minutes of incubation at room temperature, 40 μL of LINPEI 25/DNA complexes were added to the cells and incubated for 6 hours at 37°C. The cells were then rinsed and supplemented with new medium. For this assay (Figure 4), HEK-293 cells were seeded into 96-well plates at a density of 2×104 cells per well the day before transfection. For each well, 100-ng reporter plasmid (psiCHECK2-IRES) and 1000-ng mHsPUM1-HD-expressing plasmid were diluted in HBS buffer, mixed with LINPEI 25, and used for transfection. Co-transfection of wHsPUM1-HD-expressing plasmid or empty pcDNA3.1(+), along with the reporter plasmid, was also used as the negative control. After 24, 48, and 72 hours, the luciferase activity of the transfected cells was determined using dual-luciferase reporter assay system (Promega Corporation; Madison, WI, USA), according to the manufacturer’s instructions. Briefly, passive lysis buffer (PLB) was added to the cells and incubated at room temperature for 20 minutes on a rocking platform. The lysate was then transferred to white plates (Sigma-Aldrich; St. Louis, MO, USA) and 100 μL of luciferase assay reagent II (LAR-II) was added to each well and mixed. The Firefly luciferase activity was quantified and then the Stop & Glo Reagent was added and mixed. The Renilla luciferase activity was also quantified. The luciferase activity was measured by Synergy 2 Multimode Reader (BioTek Company; Bad Friedrichshall, Germany). 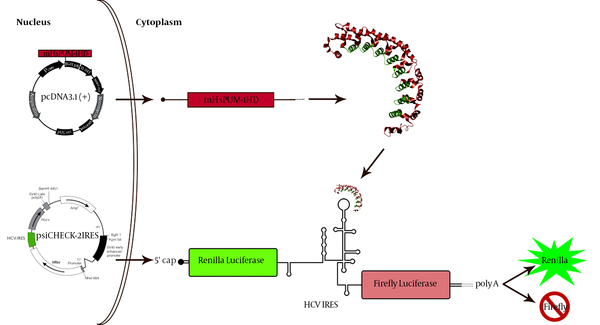 The activity of both Firefly and Renilla luciferases was normalized to non-transfected cells. In addition, the level of each Firefly luciferase activity was normalized to the level of Renilla luciferase activity. The mean Firefly luciferase activity from the cells, cotransfected with pcDNA3.1(+) and reporter plasmids, was set at 100% and used to compare with the mean Firefly luciferase activity from mHsPUM1-HD-expressing cells. Assays were performed in triplicate and repeated at least twice; the results were expressed as mean ± SEM. HEK-293 cells were seeded into 96-well plates at a density of 2×104 cells per well and transfected as described above. At 72 hours after transfection, 15 µL of 3-(4, 5-dimethylthiazol-2-yl)-2, 5-diphenyltetrazolium bromide (MTT) (Promega Corporation; Madison, WI, USA) solution (5 mg/mL) was added to each well and incubated for 4 hours at 37˚C in 5% CO2. The cells were washed with PBS, and then 100 µL of dimethyl sulphoxide was added to dissolve formazan crystals. The plates were finally measured at a wavelength of 570 nm, using the Anthos 2020 microplate reader (Biochrom Ltd; Cambridge, UK). All experiments were performed at least twice (in triplicates), and differences between the mean values were compared using analysis of variance (one-way or two-way ANOVA). Statistical analyses were performed, using GraphPad Prism 6 software. P-values less than 0.05 were considered statistically significant. The expression of control and modified HsPUM1-HD genes was induced by 1mM IPTG from pET-28b plasmid in BL21(DE3) cells. The cells were lysed via sonication and the supernatant was resolved by SDS-PAGE. The presence of control and modified HsPUM1-HD proteins (41 kDa) in the supernatant was confirmed by western blot analysis (Figure 5). In order to confirm the sequence-specific binding of mHsPUM1-HD to its cognate sequence, pull-down assay was performed, using biotinylated bait RNAs and streptavidin-coated magnetic beads (Figure 3). The let-7i sequence was used as a backbone to design the two bait RNAs. In this assay, the target (UGGAUAAA) and control (ACAACAUA) sequences were implanted in the middle of the second loop of let-7i sequence in order to be more accessible and not structured. The flanked nucleotides were then added one by one to finally create an 18-nt loop, attached to a 44-nt double-stranded stem (Figure 6). The online MFold software was used to predict the secondary structures. Cell lysate was mixed with biotinylated bait RNA and incubated for 1 hour at 4°C on a rocking platform. Then, streptavidin-coated microbeads were added to the solution to capture the complex in a μColumn, held within a magnetic μMACS separator. After 4 washing steps, the RNA-binding proteins were eluted from the column by washing buffer, supplemented with 1M NaCl. The flow-through, four wash and elution fractions were resolved with SDS-PAGE and analyzed with western blot. As shown in Figure 7, mHsPUM1-HD was captured by biotinylated target RNA (Figure 7A), while in case of biotinylated control RNA, no protein was captured (Figure 7B). In order to test the selective inhibitory effect of mHsPUM1-HD on HCV IRES-dependent translation, a bicistronic dual-luciferase reporter construct was modified from psiCHECK2 plasmid in which HCV IRES had been inserted between Renilla and Firefly luciferase genes. Upon transcription, the Renilla luciferase was translated in the cap-dependent system, whereas the Firefly luciferase translation was mediated by HCV IRES (Figure 2). To evaluate the non-specific translational reduction, a pcDNA3.1 plasmid expressing wHsPUM1-HD was used as the control. We first examined the effect of different plasmid ratios of pcDNA3.1-mHsPUM1-HD to psiCHECK2-IRES on translation inhibition. Our results showed a dose-dependent decline in HCV IRES-dependent translation at 48 hours after transfection when the Firefly luciferase activity significantly dropped by increasing ratios (1:1, 5:1, and 10:1) of mHsPUM1-HD-expressing pcDNA3.1(+) to psiCHECK2-IRES reporter plasmid (Figure 8A). Therefore, the 10:1 ratio was used in all translation assays in this study. The relative ratio of Firefly to Renilla activity, 72 hours post-transfection of mHsPUM1-HD (ratio 1:10), dropped significantly by 40%, while the observed 7% decline for wHsPUM1-HD was insignificant (Figure 8B). Moreover, the expression of mHsPUM1-HD in HEK-293 cells showed no cytotoxicity in MTT viability assay. No significant difference was found in the viability of cells at 72 hours after transfection with DNA constructs (Figure 8C). The expression of wHsPUM1-HD and mHsPUM1-HD in HEK-293 cells was confirmed by western blot analysis, as well (Figure 8D). In this study, we engineered a toolkit to target a specific sequence in HCV IRES in order to potentially inhibit the virus polyprotein translation. The estimated sequence specificity of mHsPUM1-HD to its cognate sequence was confirmed by pull-down assay, in which mHsPUM1-HD was captured by its cognate sequence, embedded in the loop structure of a biotinylated RNA. Since the present study mainly focused on verifying the ability of mHsPUM1-HD to bind specifically to its target sequence, we did not apply any quantitative test, in this regard. However, quantitative approaches are warranted to provide an in-depth image of the binding affinity and specificity of this engineered protein, which will be analyzed in our future studies. 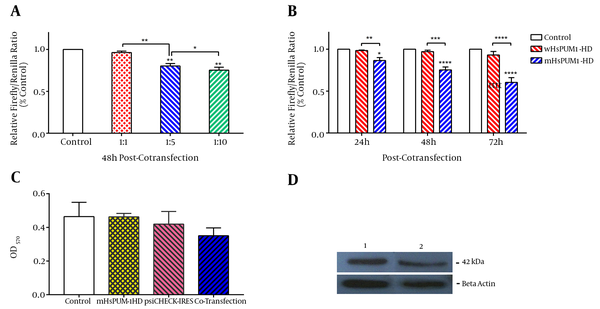 Cotransfection of HEK-293 cells with plasmids expressing Firefly luciferase (under the control of HCV IRES) and mHsPUM1-HD resulted in a 40% decline in Firefly translation. This decline showed that HCV IRES-dependent translation can be altered by this engineered HsPUM1-HD. Indeed, mHsPUM1-HD was designed to bind to stem-loop III of IRES, which has been shown to be responsible for interaction with eIF-3 (19). Although the detailed mechanism is yet to be defined, binding of mHsPUM1-HD to its target appears to interfere with eIF-3 binding and subsequent interactions with 40S ribosomal subunit. While some current strategies, such as the use of RNAi or aptamers, can reduce the translation level to some extent (13, 20-22), our approach differs from these methods, as it can be effective in organisms or cellular compartments where aptamers or RNA interference machinery is not available (17). Our knowledge about gene therapy and expression tools also enables us to stably express mHsPUM1-HD in vivo, whereas the delivery and in vivo stability of antisense oligonucleotides are still difficult to control (17). Moreover, this RNA-binding module, which recognizes an 8-nt target sequence (23), has target discrimination power; similar to that of miRNAs, which recognize the targets mainly by a 7- or 8-nt seed match (24), resulting in possible off-target effects. In case of mHsPUM1-HD, off-target effects can be minimized by using two tandem PUM-HDs (15, 16) or a PUM-HD with more repeats (25), providing additional binding specificity and selectivity, while this concern cannot be addressed for miRNAs (26). Use of PUM-HD as a targeting element also provides additional possibilities for the fusion of different functional domains, while tissue-specific expression is maintained with appropriate promoters (26). As such, this strategy can be applied for engineering translational regulators (14), RNA probes (15, 16), splicing factors (17, 27), and RNA endonucleases (28). As indicated, a properly designed HsPUM1-HD can repress the translation of HCV with high selectivity. These potentials and several other advantages can support this protein as a candidate for anti-viral therapy. They include affordability for diverse applications such as therapy and the possibility to modify mHsPUM1-HD to target a sequence within the viral genome, which is highly conserved in all virus strains (leading to the reduced emergence of resistant viruses). Moreover, cellular tolerability of this natural protein is a further advantage. However, further studies are required to determine whether expression for more extended periods with different levels will induce toxicity. This study is the first description of a designed HsPUM1-HD protein, aimed to test the repression of HCV IRES-dependent translation. With regard to the results obtained in this study, further investigation is being performed to elucidate the ability of this protein in reducing HCV replication in Huh7.5 cells. Evaluation of mHsPUM1-HD antiviral effects on other viral infections, along with the improvement of mHsPUM1-HD potency and specificity through the fusion of effector domains, remains to be addressed in future studies. The authors would like to thank Prof. Marvin Wickens and Dr. André P. Gerber for several helpful discussions during the course of this study. We also express our gratitude to Dr. Shohreh Shahmahmoodi, Dr. Fazel Shokri, and their colleagues for their great assistance regarding the study materials and equipments. We acknowledge the members of the Immunotherapy and Leishmania Vaccine Research laboratory and General Virology laboratory of Pasteur Institute of Iran. Also, we would like to thank Dr. Sayed Mahdi Marashi for the final review of the manuscript. Authors’ Contribution: Seyed Jalal Kiani and Katayoun Samimi-Rad contributed to designing the project, performing the experiments, analyzing the data, and writing the manuscript. Tahereh Taheri and Sima Rafati contributed to performing the cloning steps and protein expression in the prokaryotic system. Kayhan Azadmanesh and Ahmad Nejati contributed to HEK-293 cell culture and performing the dual-luciferase reporter assay. Monireh Maleki contributed to performing the pull-down assay. Also, Seyed Moayed Alavian and Talat Mokhtari Azad contributed to data analysis. Funding/Support: This study was part of a PhD dissertation, supported in part by Tehran University of Medical Sciences (grant No: 22229) and Baqiyatallah University of Medical Sciences (grant No: 1989). 4. AASLD-IDSA. . Recommendations for testing, managing, and treating hepatitis C.